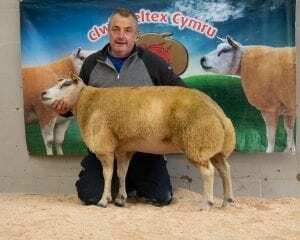 An aged ewe from Sion Jones claimed the Supreme Championship before selling for the top price of 1000gns at the sale of in-lamb females and ewe lambs at Welshpool. 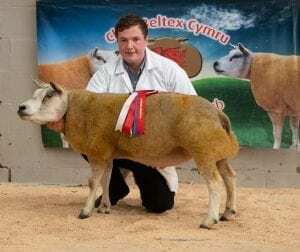 Rising to the top was Fronarth Bluebell, a 2016-born Pantgwyn Wil daughter bred from a home-bred female by Quarrymount Penney in Sion’s flock near Pennant, Llanon, Ceredigion. Bluebell sold to IRH Bebb, Ffridd-Conwy, Llanwddyn, Shropshire, having been AI’d in September to the 3,000gns Muirton Buchan Loon. The champion from Sion Jones sold for 1,000gns. Second best at 580gns was Cerin Coline Jones, a Shearling Ewe from W & E Evans, Dderwen Gam, Llanarth, Ceredigion. 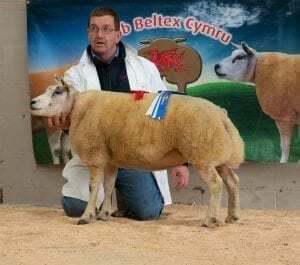 Full of home breeding, being by Cerin Tarw and out of Cerin Wynne, she was served in October by Cothi Bush Hogg and sold to IE Roberts & Son, Llanwddyn. A shearling ewe from W. And E. Evans sold for 580gns. The Evans also sold their second prize Shearling Ewe, Cerin Colomen, another by Cerin Tarw, to JP & CM Jones, Penegoes, Powys, for 420gns. Bred from Cerin Win, she was also AI’d to Cothi Boss Hogg in October. Aged Ewes were in demand as making 520gns when sold to ED Jones, Smithy Fen, Cambridge, was Bailey Brook Alice ET from D Costelloe, Bletchley Court, Market Drayton. This 2015-born ewe by Southern Acres Rambo is out of Bailey Brook Repeat. D Costelloe also received 400gns for the previous lot and second prize Aged Ewe, Bailey Brook Amelia ET, another 2015-born Southern Acres Rambo daughter but this time out of Bailey Brook Review. She sold to J Swinnerton, Market Drayton. The Reserve Champion, a Shearling Ewe from R & S Rattray, New Cross, Aberystwyth, sold to N Evans, Cemmaes Road, Powys, for 460gns. Rattray’s Cymraes, a Dooley Thurston daughter out of Rattray’s Nesta, was AI’d in October to Corra Champion. The reserve champion from R. And S. Rattray sold for 460gns. 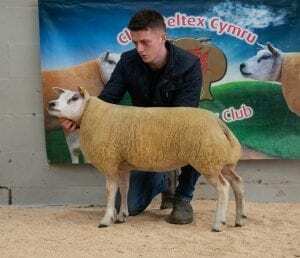 Matching a previous 420gns when sold to JT Jones, Llangadfan, Powys, was the dearest of the Ewe Lambs, Crew Dance All Night ET from Rhys Francis, Abergorlech, Carmarthenshire. This February-born entry which picked up a blue ticket at the show is full of Belgian breeding, being by Zorro and out of an imported Van’t Hoveke ewe. The highest price ewe lamb at 420gns from Rhys Francis. The first prize Ewe Lamb, Dolydd Delyth from Tecwyn Hughes, Dolydd, Gaerwen, sold to N Oughton, Montgomery, for 320gns. Another born in February, her pedigree features Hackney Wonderboy on to Namara Taryn.